Brighton Foodies Festival 2018, held on Hove Lawns from 5th to 7th May, includes a brand new Musicians Against Homelessness music stage, 4 performance ‘theatres’ and 30 food stalls – all under the cover of marquees from ABC. 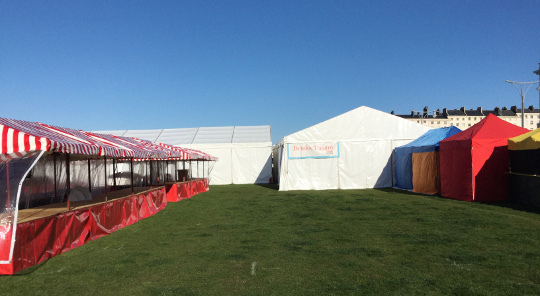 The festival has hired 18 marquees in total, confirming it gets bigger every year! The largest marquee is the flagship Chefs Theatre at 9m x 18m and a generous eave height of 3m, provided with wooden floor and green carpet. There’s also a Drinks Theatre and a Cake & Bake Theatre, both at 9m x 15m with the taller 3m eave height, plus the Exhibitor Tent (9m x 15m), Feasting Tent (6m x 15m) and Kids Theatre (6m x 12m), all with the usual eave height of 2.3m. Two 6m x 6m marquees and ten 3m x 3m marquees will complete the festival grounds, with various uses from the necessities of Tickets and First Aid, to the glamour of Performers and Prosecco and the less glamourous Washup tent! Several marquees will be supplied with accessories including wooden flooring and carpet, partitions and banner rails, and just one – the Band Tent – with ivory marquee linings and valance. Brighton Foodies Festival is open on all three days of the Bank Holiday weekend with extended hours on Saturday and Sunday until 9pm. There’s dozens of ‘foodie’ presentations, live music from Toploader and The Hoosiers plus Burlesque baking, cream pie throwing, cheese stretching and chilli eating competitions and plenty of fun for the kids.